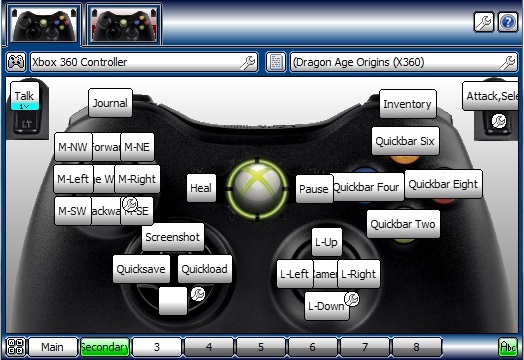 Love playing Dragon Age? Love sitting your buttocks down on a comfy sofa? Then this is the Profile for you!
. Firstly, you will need to reset the controls to their default setting.
. Secondly, if you want to use the Select button for healing, move your health poultices to "0" on the hot key bar, this will make you able to heal yourself.
. That's it, your new Profile should now work fine!
. Right Analog Stick acts as free camera.
. When changing the camera, press the right stick once to zoom out, and hold it to zoom in.
. Holding the D-Pad Right will access the Spells & Talents menu.
. Holding the D-Pad Up will show all visible objects.
. Holding the D-Pad Down will show the world map. Hiiiiiiiiiiiiiiiiiiii! Do you like other games? Goooooooooood! Because I've made other profiles, for other games! Last edited by DaNuttyNoob on 30 Aug 2014, 00:20, edited 4 times in total. I'll try your profile ! Last edited by oliver twist on 20 Jun 2014, 08:39, edited 2 times in total. No problem! I hope you enjoy the profile. Profile not working for me. Trying to use with xone controller. I have the latest version of xpadder and followed instruction to no avail. To answer h_wade: Sorry that the profile isn't working for you, I don't own an Xbox One or it's controller so I haven't ever tested it. Using my 360 controller the profile does still work, so I believe that if you can use one of those you should be fine. Hopefully, one day I'll get one for myself; test it and then try to make my profile work with it. To answer fso.beatz: Thanks for the thanks! But I haven't made a profile for Skyrim! To answer skalp: Thanks for the thanks!